Bluehost Plus Hosting Plan: Is it Right for You? BlueHost Plus plan is a fully featured and win-win deal as it packed with unlimited resources to host unlimited websites and the most suitable package that you can buy. BlueHost is one of the most popular and affordable shared web hosting providers out there to create a website. No doubt many starter bloggers start their blogging journey with them. That is why there are different plans to choose from such as Basic, Prime, and BlueHost Plus hosting plan to meet every user’s need. The very basic package is suitable for newbies as it allows hosting one website and also packed with small resources which fulfill newly created or single website needs. However, for more domains, Plus and Prime would be the perfect choice for you as both are capable of hosting unlimited sites, web space and unmetered bandwidth. Picking the right BlueHost hosting plan is essential, and it can also help you save few bucks that you may spend for unnecessary features. For instance; if you’re planning to host a single website then why choose Plus package? Though it comes with advanced features but chances are you may not use any of them as a newbie user or found them useless at the beginning stage. So, before buying any Bluehost shared web hosting plan, I highly recommend you must figure out how much storage and bandwidth you need, how many domains you’re going to host, etc. Is it crucial to get email spam expert? Or is it essential to subscribe a plan that can host unlimited websites? In this article, I will try my best to help you decide if “BlueHost Plus Plan” is right for you and quick review to explain what features it packed. I also share website loading speed and uptime tests snapshots to let you know BH servers stability and reliability along with price comparison. But before that here is a quick overview of the company you might be interesting to know. BlueHost was founded in 2003 by Matt Heaton to offer quality, reliable, and affordable web hosting for individuals and businesses. It is now one of the top 10 hosting services in the world and empowering more than two million websites under their management along with its sister companies. Endurance International Group (EIG) is the parent company of BlueHost since 2010. You can buy shared, VPS, dedicated, reseller, WordPress optimized, and cloud hosting as well as register domain names with them. All of their data centers located in the USA and it’s one of the hosts that are recommended by the WordPress.org. Recently, they have launched exclusive tools for WordPress CMS and included Let’s Encrypt SSL in all of their shared hosting packages. You can enable it within few clicks with zero technical skill. Let’s start with price comparison and then I will talk about features and benefits of Plus hosting plan by BlueHost. There are three shared web hosting plans available to choose from which comes with different resources and features. 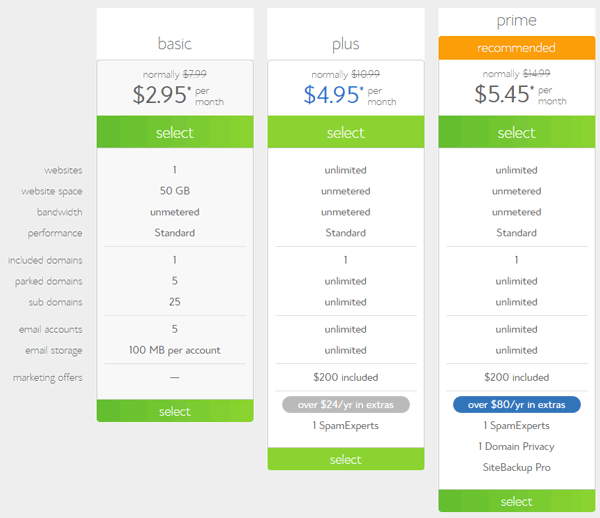 However, Plus and Prime have almost similar features except free domain privacy and SiteBackup Pro. You get a FREE domain name and standard server performance with the exception of any plan. The major difference between the “Basic” and “Plus” is the first one allows single domain and also limited storage space but “Plus” enables you to host unlimited websites, unlimited storage, and no bandwidth cap. Other packages besides “Basic” also allow you create unlimited sub-domains as well as unlimited parked domains. Note: Due to promotions, you might see price fluctuations. So, please visit through below button to check the latest prices. Apart from the “Basic”, higher plans come with unlimited web space, unmetered bandwidth, and also unlimited websites that you can host on a single account. There’s also a big difference between Basic and Plus/Prime packages as well. Like you’re not limited to park specific domains, create sub-domains, branded email accounts, and email account storage limit. Basic: It is suitable for newbies and starters to create a website and if they don’t have any plans to host further sites in the near future. It includes everything to manage a newly created or single site such as monstrous 50 GB storage, unmetered bandwidth, five email account with 100 MB storage limit. Free domain name for one year and free Let’s Encrypt SSL also included. Plus: Plus has everything that includes in the “Basic” but there is no storage limit as well as unlimited allowed domains on a single account. You get a whopping $200 worth marketing credits and a free $24 worth 1 SpamExpert to protect your email box from junk and spam emails. Furthermore, there is no email account storage limitations, no specific parked or sub-domain restrictions, and you can create unlimited email accounts. BlueHost Plus hosting package is fully featured and most suitable plan that money can buy for you. Prime: The highest plan that comes with all the advanced features, includes all the “Plus” features and also 1 Domain privacy protection, Unique IP address as well as free SiteBackup Pro. If you compare it with “Plus” you’ll see the only difference is WHOIS protection and data backup. That’s why I recommend choosing “Plus” plan because, in most of the cases, these features are not required. Is BlueHost Plus Hosting Plan Fast and Reliable? Reliability and fast website loading speed are one of the crucial factors while choosing the web hosting for your business. Loading speed is one of the 200 ranking factors, so your website should load within 2~3 seconds to get some ranking signals in SERP. BlueHost has custom developed softwares and own servers to deliver unbeatable performance, usability, and reliability for shared hosting users. They have resources protections technology to temporary freeze any account which exceeds their specific limits to maintain other users resource which results in high speed and max. uptime. You may know, in shared web hosting, multiple users utilize the single server, and when someone’s website get traffic spikes, it can harm other site’s performance on the same server. Instead of sharing the last 7 days or one-month uptime history, the above snapshot contains last three months uptime and downtime statistics. As you can see, uptime is not bad at such an affordable prices. When we compare these stats to many other shared web hosts, it’s quite acceptable. BlueHost Plus hosting account as well all other plans includes 24/7 live chat, phone, ticket, and email customer support to help you fix any issue immediately. They have WordPress experts and hosting professionals to address your problem and fix them within no time. It just takes few minute to get connected with support agent through live chat or phone call. Moreover, a giant knowledge base section also available where you can find solutions and easy to follow DIY tutorials. It not only help you fix your problems but also the best way to learn technical stuff to improve your skills. They have a lot of informational contents which you can start surfing right away. Like other plans, Plus Hosting plan also includes exclusive WordPress tools which play a vital role to manage WordPress based websites. For example; you can utilize WP tools to update your website’s core files, plugins, and themes without logging to your site dashboard. You can also take manual backups, enable/disable SSL certificate, reset user password, optimize performance, change PHP version, activate CDN, and change site URL’s right from the exclusive WordPress tools dashboard offered by BH. All of these comes with no extra fees. What if They Failed to Deliver What They Claim? Are you still confused if the BlueHost’s Plus hosting plan is right for you? Well, here is another best thing, they offer a 30-day money back guarantee. If you found them unsatisfied or they failed to deliver what they claim, you can always ask for the full-refund to get your money back. They return your money with no question. Don’t you think a whole month is enough to try their services? Conclusion – Is BlueHost Plus Hosting Plan “Right” for You? Are you going to start a new website or it’s a small personal blog or business website? Do you have plans to create more websites in the future or need web hosting for more than one website? BlueHost Basic package is the best fit for the users who just planned to maintain a single site. It also includes enough storage, email accounts, parked domains, and subdomains to handle a single blog or small business site. Also, affordable and cheaper than other plans. On the other hand, if you need more resources like capabilities to host multiple websites, unlimited storage, bandwidth, email accounts, sub-domains, and 1 SpamExpert then choosing the “BlueHost Plus” account would be the best decision you can make. You also get $200 worth marketing credits to advertise your site in search engines as well. Is it enough to clarify “BlueHost Plus Hosting” features, benefits or if you should choose it your business or blogging websites? Need further assistance? No problem at all, just ask in the comments sections, I will be more than happy to help you figure out this.